Thank you to everyone who helped us fill Walter Hall last night, here in Toronto! What a wonderful evening! This was my first opportunity to hear Garry Kvistad’s “Mallet Phase” on newly created instruments, and the two new Russell Hartenberger suites: “Moondog Suite” and “Persian Songs”, with Iranian vocalist and setar performer Sepideh Raissadat. The evening began with a special treat: a Bob Becker marimba solo, “Dance of the Octopus” by Red Norvo. Bob arranged the piece for solo marimba and this was the inaugural performance on a beautiful new Marimba One generously donated to the University of Toronto percussion department by Carolyn Lake. “Mallet Phase” made our ears perk up, as Garry and Russell performed on wooden bars (patterned on the Ugandan amadinda xylophone), tuned wind chime tubes (of which, as Garry (owner of Woodstock Chimes) pointed out, he “happens to have a great many lying around”) and PVC pipes slapped with foam paddles that Garry referred to as “slap sticks” – tongue firmly in cheek. Aside from the astonishing rhythmic solidarity of Garry and Russell, all three of Garry’s new instruments are tuned in just intonation, making the piece particularly interesting. “Mallet Phase” is an arrangement of Steve Reich’s “Piano Phase”. “Moondog Suite” was a wonderful collection of 6 pieces by Louis Hardin (aka Moondog) arranged by Russell for NEXUS and vocalist (Sepideh Raissadat), with titles such as “Snakebite Rattle”, “Wind River Powwow”, and “I’m This, I’m That”. These pieces just made me smile – and Russell’s arrangments made the NEXUS members smile too. You can see that they have such a great time performing this suite! After intermission came the suite that a great many of the audience members had been particularly awaiting: “Persian Songs” featuring the evocative voice and intricate setar music of Sepideh Raissadat. Russell and Sepideh obtained permission from composer Reza Ghassemi (a well-known Iranian novelist, theatre director and musician now living in Paris) to create new arrangements of the pieces that were recorded by Sepideh and the Moshtaq Ensemble on the CD “14 Cheerful Pieces”. The blending of marimbas, vibraphone, the lute-like setar and Sepideh’s voice was a remarkable and wonderful aural experience! Loved it! And the audience did too, with a long standing ovation. Afterwards, I spoke to NEXUS member Bill Cahn and when I mentioned “Persian Songs”, he simply placed his hand over his heart and gave a little shake of his head – I believe his eyes were moist. We were honoured by the attendance in the audience of Naser Masoudi (b. 1935), one of Iran’s most famous singers, known as the Nightingale of Gilan. Gilan is the name of his home region in northern Iran. Most of his popular songs are in Gilan’s language, Gilaki. It was a spectacular evening, and I am delighted to say that NEXUS and Sepideh are heading into Toronto’s Noble Street recording studios this week to record this program! 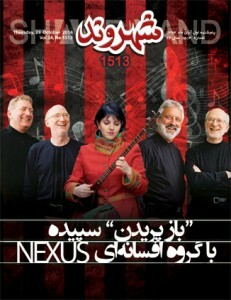 NEXUS and Sepideh sell out at Open Ears Festival!